Manufactured as per the set industrial norms and guidelines, the quality of the offered range of Platelet Incubator Agitator is always maintained. Owing to the quality raw materials and modern technology used in its making, the offered range provides highly commendable functioning. In addition, we mark this range at the best possible rate. No damage to blood cells. Fixed visual alarm in case of variation in strokes beyond specified above. Audio visual alarm in case of variation in strokes beyond specified above. Digital microprocessor temperature controller factory set to 22 deg. C.
Have non – CFG commercially available refrigerant. Have heavy duty, air cooled forced air refrigeration system. 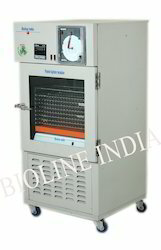 Looking for Platelet Incubator Agitator ?